You make the best scones in the town where you live. So why are you sending your beloved Aunt Bea some prepackaged fruit basket for the holidays? Or worse: another meaningless scarf-and-glove set? This year, why not give something that you would actually enjoy making (and that will thrill your friends and relatives). "Although we can now purchase almost anything premade, packaged, and delivered to the door, I believe people still know the difference between homemade and store-bought," writes Judith Choate in her new book, Homemade. "And they welcome and truly value the real thing." 1. Before you begin the final wrapping, it is important that every homemade gift be labeled with its name, date of preparation, and, if necessary, a tag giving cooking or serving instructions. 2. I save decorative bottles and jars all year long. Many imported vinegars, oils, and condiments come packed in beautiful and unusual containers that are easily reused. It is fun to buy old containers at auctions, flea markets, and thrift shops. 3. Most baked goods stay fresher if they are first tightly wrapped in plastic film or cellophane and sealed closed. Some cakes and breads look perfectly fine wrapped in aluminum foil, sealed with stick-on seals, and tied with a pretty cloth ribbon. 4. Cookies are easily given in almost any covered container, ranging from a shoe box covered with decorative paper to reusable new or antique tins or cookie jars.... Children, of course, find homemade cookies a real treat, but they love them even more when they arrive in a special container — inexpensive sandbox toys, plastic trucks, and carrying cases all work well. 5. Gift containers for candy and nuts can be almost any size or shape. I often reuse cans that have plastic snap-on lids such as those in which you purchase nuts, ground coffee, and snacks. These can be spray-painted or covered with decorative self-stick papers or kraft paper on which stickers or free-form designs have been placed. Oatmeal and cornmeal containers and shallow plastic pans are also terrific for this purpose. 6. Canning jars can simply be labeled and given as is, but I often jazz them up by cutting circles (with pinking shears) of colorful fabric somewhat larger than the lids and screwing the fabric circle under the outer ring to make a fancy hat or by trimming the lids with raffia or yarn. A more elaborate garnish is to glue beans, seeds, or spices to the lid; this works only when the trim reflects the contents of the jar. 7. Cakes, breads, and tea breads should be wrapped in foil or plastic film, labeled, and then gift-wrapped. With the exception of long-lasting fruitcakes, most cakes should not be shipped unless they are sent for overnight delivery on the day they were baked or shipped frozen for express delivery. 8. Bar and drop cookies are the best long-haul shippers. Almost all other cookies are fine for local giving. Either way, it is best to either wrap each cookie individually in plastic film or carefully pack the cookies in a sturdy container (such as a tin) in layers, separated by colorful tissue paper, rice paper, baking sheets, or waxed paper. 9. Candies and sugar-coated nuts should be shipped long distances only when the weather is cool and dry; otherwise, even with great packing, they often change texture due to temperature.... Candies, particularly, should be individually wrapped in plastic film to keep them from sticking together. The time has come to ease up on the much abused, much maligned fruitcake. It is time to be considerate and appreciative of the rich history and tastes that are passed on whenever one of these colorful treats exchanges hands as a gift -- NOT a curse, a GIFT! It is time to restore the fruitcake's good reputation. It is time to make GOOD FRUITCAKES! One month of storage is a necessity. Two, three, even four months is not too long a time if storage facilities are cool and dry. Ideally, take several days to make your cake or cakes. Prepare the nuts and fruits, pour the water or liquor to be used over them, and let the mixture stand, well covered, for two or three days. Then make the batter and bake your cakes. The cakes will be better for it and the stress in your busy pre-holiday household will be eased! Do it your way. If there are certain fruits you don't like, you can always include more of another or some of your own favorites. Dried fruits cooked in juice can take the place of candied fruits, and seeds can replace nuts. If the recipe calls for brandy and you don't have or like it, use wine or even a fruit juice of your choice. If the recipe calls for citron and citron is not your 'thing', substitute another candied or dried fruit. If raisins aren't your 'raison d'être', use more chopped dates and less raisins. If the recipe calls for particular amounts of candied pineapple and cherries, the same weight of a fruit mix can be used. The only important thing is that the weight of the fruit and nuts should be approximately the same as in the original recipe. Within this boundary, you can make any substitution; it's your right to choose! In choosing, just go with your very own fruitcake flow: Do it your way! The first step in fruitcake preparation is to assemble, chop and pick over the fruit. You might be using dried apricots, figs, dates, currants or raisins. Whichever combination you prefer, softened, tenderized fruit should be used. Soaking removes the crystalline sugar coating and causes fruit to absorb sufficient moisture. Poor-condition fruit will draw moisture from the surrounding cake structure and cause crumbling. Fruit to be used should be placed in just enough water, liquor (rum or bourbon) or fruit juice to cover, and allowed to sit until liquid has been absorbed, at least overnight but 2 to 3 days if possible. After fruit has soaked, place it in a saucepan with your chosen liquid, cover and simmer for 10 to 15 minutes, adding more liquid if necessary. Let stand, and drain well. This will restore freshness and prepare the 'fruits of your labor' for the rest of the process. Dredge the fruits and nuts in flour in order to keep them from sinking through the batter to the bottom of the pan while baking. Moving right along, you progress to the point of 'all together now'. Stir together the batter, fruit and nuts and try not to break your wooden spoon! Meanwhile, preheat your oven; always bake fruitcakes slowly, at a low temperature range between 275 to 325 degrees F (135 to 165 degrees C). Prepare your pans by greasing, flouring or lining with parchment paper. This will prevent cakes from burning during the long baking time. When mixture is ready, spoon it into your liberally greased/lined pans, pack it firmly and tap pans to remove any air bubbles. It's baking time! Once the oven is hot, slide that fruity baby right in there and let her bake. Set the fruitcake pans in a baking dish half-filled with water to prevent burning around the edges. Place cake pans on rack in the center of the oven; pans (if there's more than one) should not be touching each other. To prevent burnt, hard-crusted fruitcakes, cover pans with aluminum foil for the last 1/2 hour of baking. If at any point the cake is browning too fast, place a sheet of foil over it to give it some 'shade'. No matter what recipe adaptation you're trying your hand at, baking time should be measured according to the size of pan being used. If changing pan sizes, remember to also alter the baking time. Be sure to test for doneness - don't guess by the color! The variety of ingredients makes color a totally unreliable indicator in this case. Test for doneness by placing a metal/wooden skewer or a toothpick in the center of the cake. If it comes out clean, crumb-less and carefree, the cake is done! Be careful not to over-bake! Hey! Cool It! That's A Wrap! When the baking time is done, then it's time for cooling fun! Always cool fruitcakes for 10 to 15 minutes on a rack in the pans in which they were baked. Then turn them out of the pans onto the rack and carefully peel off the paper. Now, the fun part. Get some cheesecloth and spirit of choice, or whatever liquor or wine was used in the recipe. When the cakes are cool, poke some narrow holes in them with a skewer or cake tester; this will enable the liquor to soak into the cake better and deeper. Sprinkle the cakes with a few tablespoons of liquor, being sure not to get the cakes too wet! Soak a piece of cheesecloth in some more liquor and wrap it around the cake. Seal in plastic storage containers, plastic wrap or plastic storage bags. Put your fruity, nutty masterpieces somewhere cool and dark. Check and 'replenish' the cakes once a week by removing the cheesecloth, brush the cakes with more liquor, and then rewrap them in liquor-soaked cloth. If you plan to store it for a long period of time, wrap the cake in brandy or wine-soaked towels, then in aluminum foil. For VERY long storage, 'bury' the liquor-soaked cakes in confectioners' sugar in a tightly covered tin, in a cool place. When wrapped in cloth and foil, saturated regularly with alcoholic liquors and kept in tightly closed containers or bags, a fruitcake may be kept for months or even years. Note that fruitcakes DO taste better with age! This is called 'ripening'. Liquor-based cakes may be stored several months in advance in a cool place prior to serving. Non-liquor soaked cakes may be kept in a cool place or in a refrigerator for short-term storage or a freezer for long storage. Fruitcakes freeze very well; however, they must be aged for at least few weeks before freezing, as they do not mellow and ripen while they are frozen. When ready to serve, slice cake/s in a sawing motion with a sharp, thin blade of a knife or with a serrated knife. Use fresh, good quality ingredients - make sure spices used are fresh. 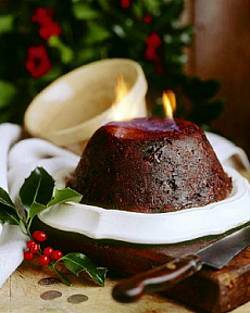 Refresh stale fruitcakes by gently heating pieces (using a microwave oven or a steamer) and serve with hard sauce, brandy sauce, glaze or desired topping. That's right. Real fruitcake is fun, festive, ferociously flavorful and fabulous. This ancient cake has a history which is as full of lore and rumor, as it is actual fact. It seems to have been designed to be kept over a period of time (surprise!) and destined to be 'chock full' of stuff because of its rich ingredients. Fruitcakes are one of the oldest surviving traditional holiday pleasures. After all, the holiday season is a time for all of us to celebrate, indulge, and connect ourselves to the food, fancies and folks of our past and our future. It's not necessarily the time to do something totally new and funky; it's the time to honor old traditions. There is a beauty to the traditional, preserved side of life just as there is a beauty to the beloved fruitcake.